This fun coloring page is just the ticket for a big game match-up. Your little sports fan will enjoy coloring in the clashing helmets on the football field background. Working on coloring will not only provide your child with a fun activity, it will help him practise fine-motor skills, too! 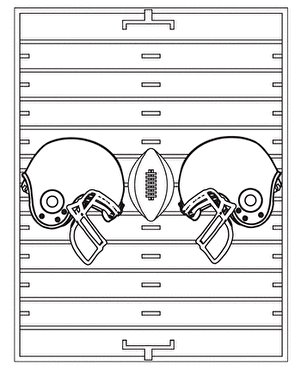 Celebrate Super Bowl season with a fun football coloring page! Your child will love coloring in the football player with his favorite team's colors. Practise simple addition with a fun football-themed maths sheet. Your child will get to practise his maths facts. Enjoy a football-themed maths sheet with simple subtraction equations for your child to practise.